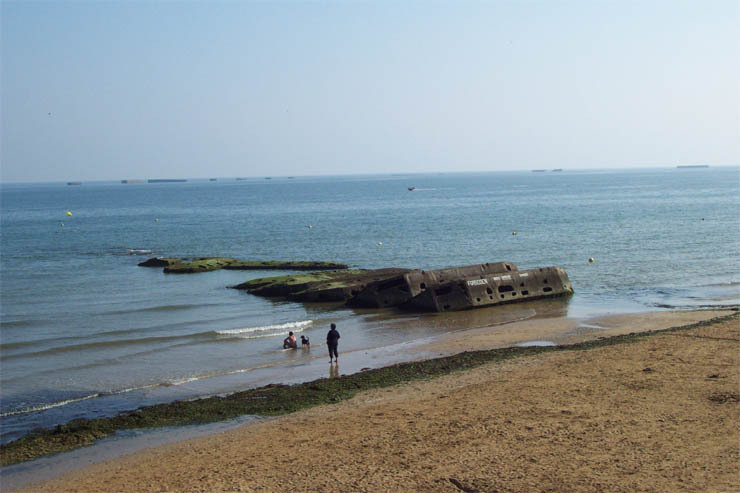 This was my first, but not my last visit to fascinating Normandy. I stayed in Bayeux, the ancient cathedral town, which was the first town in France liberated in WWII. My two intensive days in Normandy were spent seeing Omaha Beach, visiting the U.S. Military Cemetery at Colleville, examining in detail the Bayeux Tapestry, journeying to Mont St. Michel and walking around Honfleur where my first immigrant ancestor to North America left France in 1613 or 1615. Although I have seen the story of D-Day in documentaries and The Longest Day and Saving Private Ryan as well as the D-Day Museum, I still was not prepared for my discoveries at Omaha Beach. One was the scale. 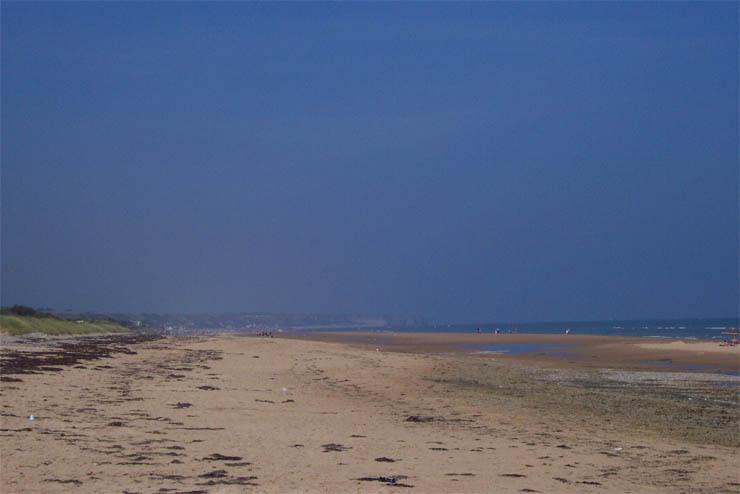 Omaha beach is 5 miles long and when the 20 foot tides goes out, the beach is a couple of hundred yards wide. All 5 beaches cover an area of 50 miles. 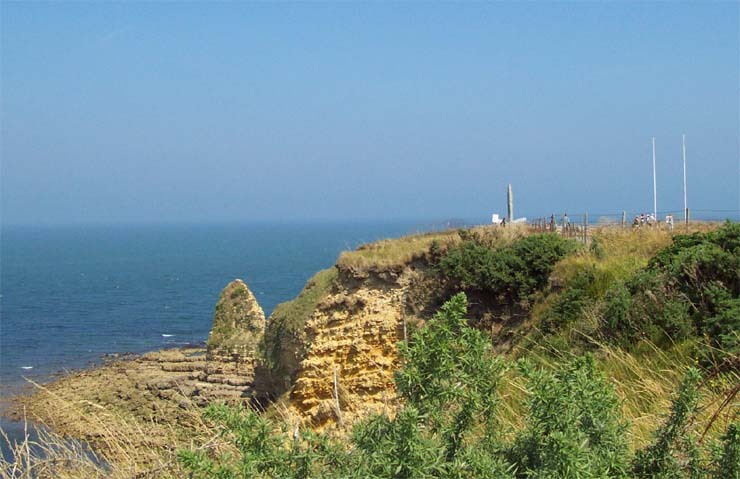 Second was the height of the cliffs over the beach and the extent of German fortification. Our soldiers were slaughtered by the murderous fire and the success of the Omaha invasion was in doubt most of the day. 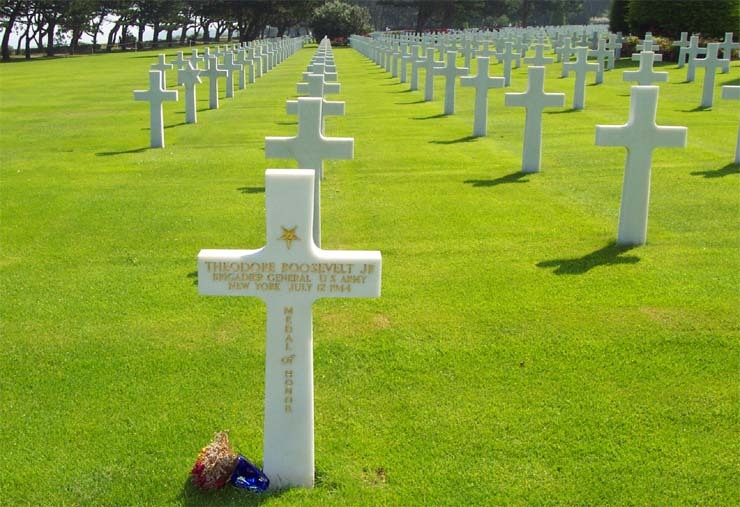 The U.S. Miltary Cemetery at Colleville is located just above Omaha Beach. This is American soil given to the United States by a grateful French nation in 1945. The Cemetery is perfectly designed, perfectly executed and perfectly maintained. It is everything that one could wish to honor the soldiers that died on D-Day or in other battles in Europe. There are 9,386 crosses or Star of David's in straight rows. They are made from Carara marble which is pure white. One grave that caught my eye was that of Theordore Roosevelt, Jr., the son of the President and thus a distant cousin. The Bayeux Tapestry, over 900 years old, is one of the treasures of European history and art. 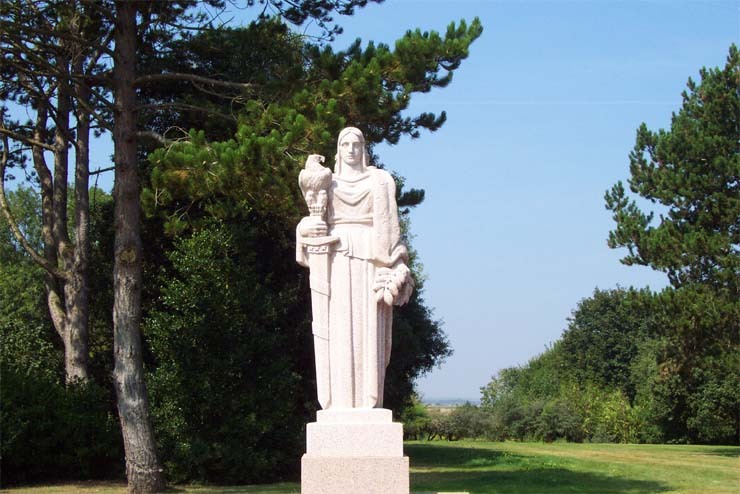 It was ordered by Matilda, the wife of William, Duke of Normandy and the Conqueror of England. 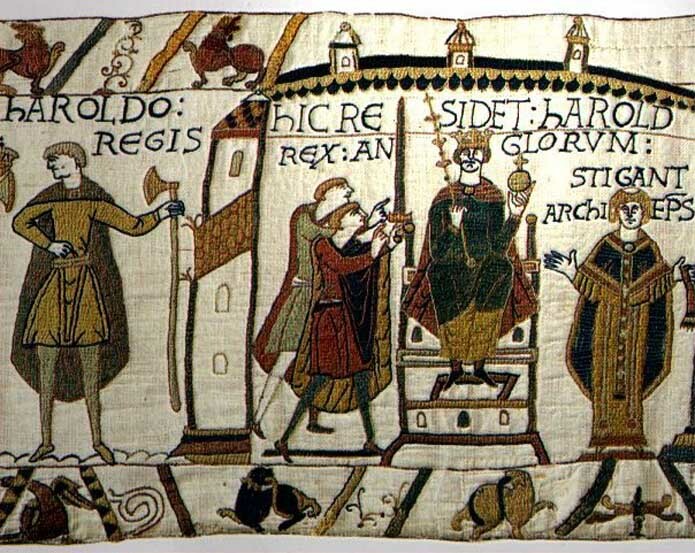 The tapestry was designed and executed in England by monks and it explains the history of the events that led up to the Norman Conquest of England. It is a sophisticated political justification for the Norman Conquest of 1066, the last successful invasion of England. The tapestry is over 200 feet long and less than a yard wide and is composed of 58 scenes -- the last 50 feet are missing. 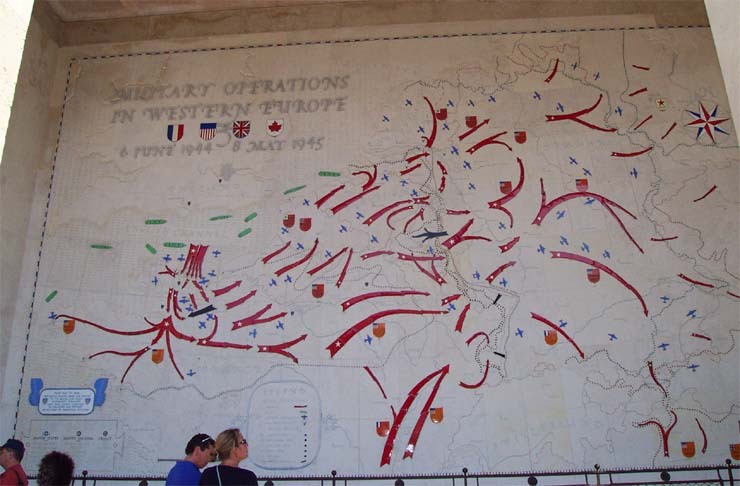 It was designed to be hung around the Cathedral in Bayeux on the anniversary of the invasion and was for hundreds of years. I spent 3 or 4 hours studying it and reflecting on the indelible impact that William, the Conqueror has had on history. There is a on-line game which allows you to create your own tapestry using elements of the Bayeux Tapestry. This is really a lot of fun. Try it. 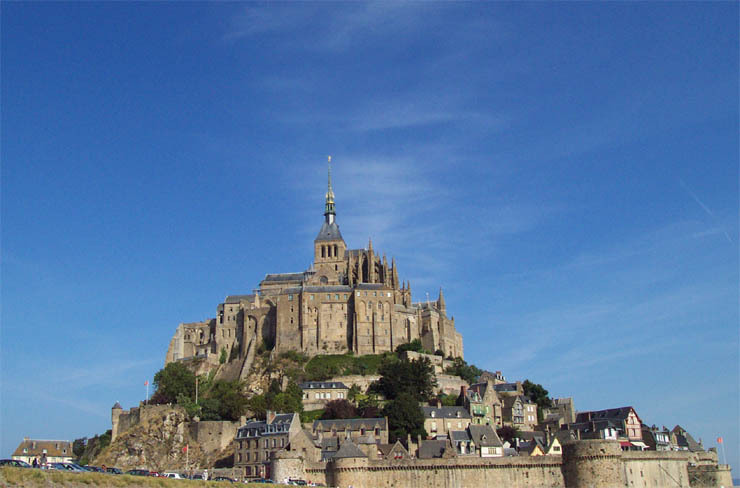 The famous abbey of Mont St. Michel has been drawing pilgrims and tourists since it was built on a tiny island off the Norman coast in 708 with major construction starting in 1020. Now most of the land between the island and the mainland has been reclaimed from the sea, but there are pockets of quick sand for the unwary. It has been a monastery for almost 1300 years except for a period after the French Revolution when it was used as a prison. Get there early in the morning before hordes of tourists arrive. My first immigrant ancestor to North America was Jacques Hertel who was born in the port of Fecamp in Normandy. 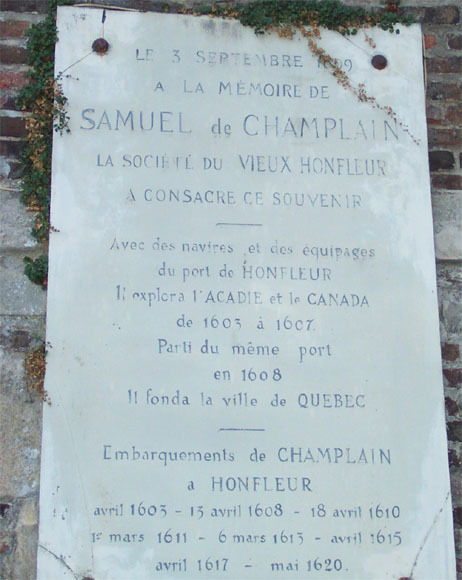 I did not have time on this trip to visit there, but did visit the picturesque port of Honfleur where Champlain left for his voyages to explore Canada. Jacques was born in 1603 and he left with Champlain on March 6, 1613 or in April 1615. Jacques lived among the Indians, learned their languages and was one of the major interpreters for Champlain. Jacques and a Mohawk indian woman had a child, Ots-Toch who married a Dutch man, Cornella Antonissen Van Slyck, and their daughter, Hilletie, became a very famous interpreter who translated the Bible into Mohawk. Jacques founded Trois Rivieres, one of the major cities in Quebec and was the progenitor of a famous family in Quebec. 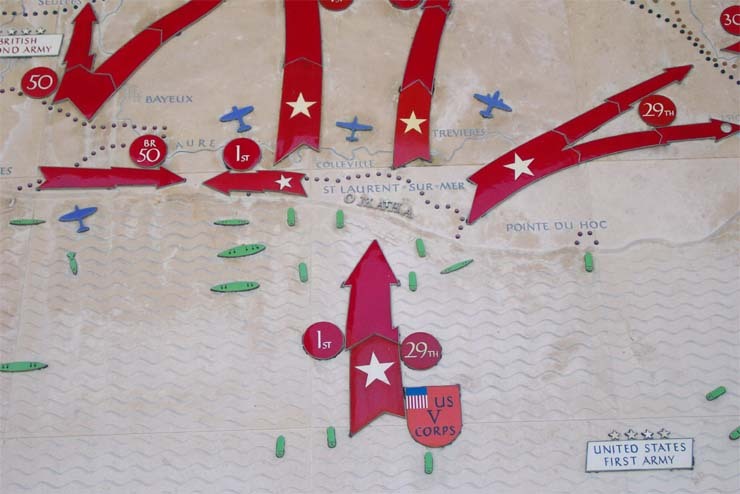 Omaha Beach is almost 5 miles long. 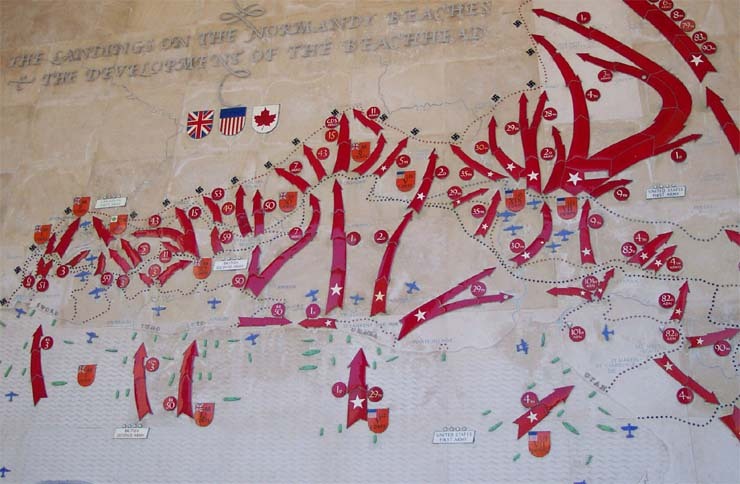 Note Colleville and Pointe du Hoc. 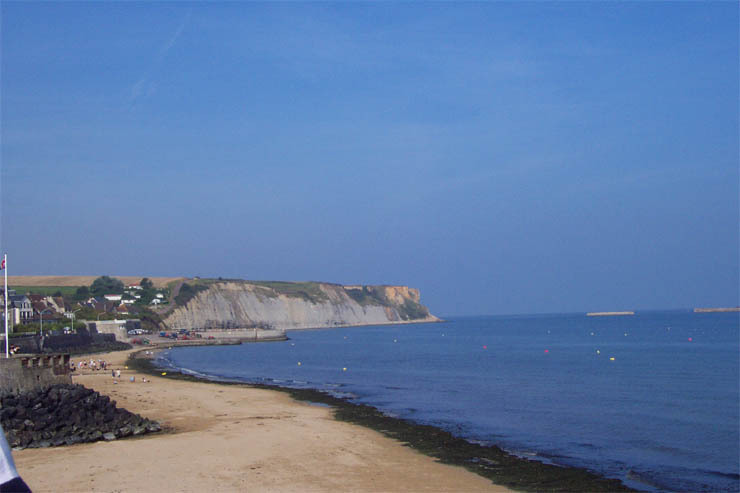 The total distance across all 5 Normandy beaches (Sword to Utah) is 50 miles. 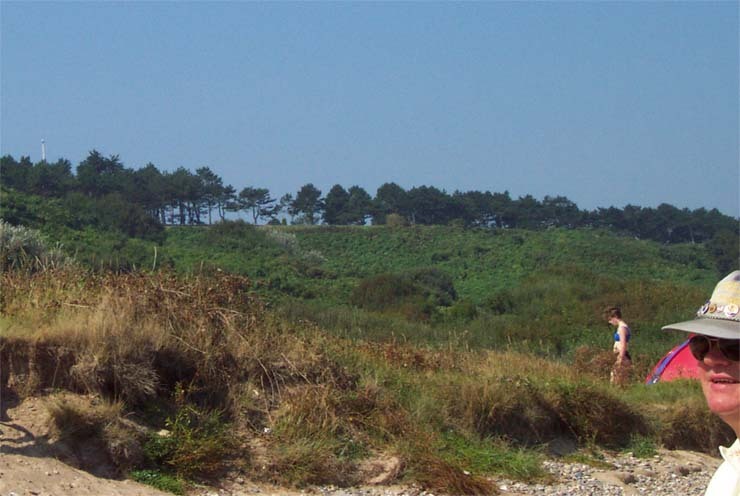 The Germans had a tremendous advantage because they held the high ground above the beach. Omaha beach is huge (5 miles by 200 yards) when the 20 foot tide is out. The remnants of the artificial harbor remain. Yellow buoys mark beach edge at low tide. 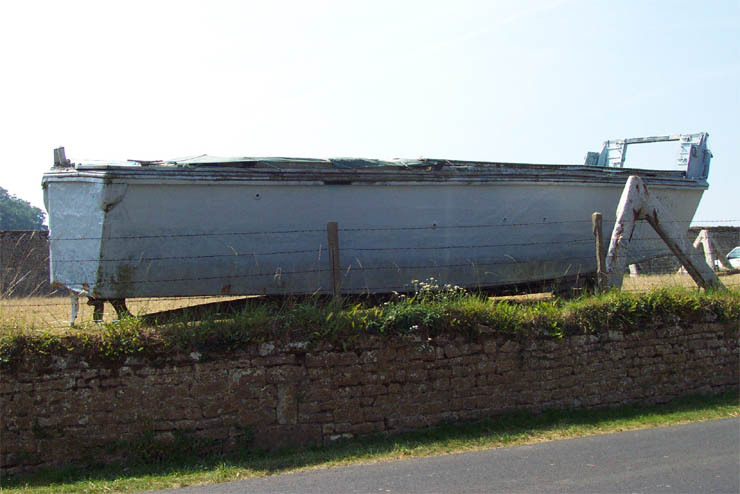 The landing craft were built mainly of wood. Soldiers were seasick from a 14 mile ride to the beach. 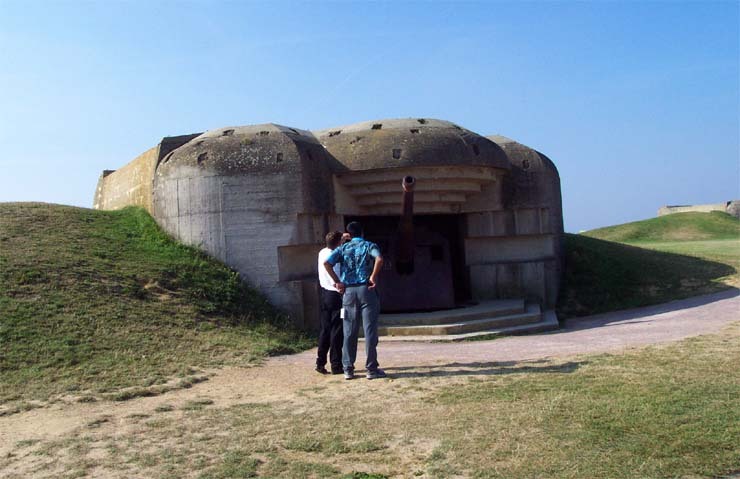 The German guns were camouflaged and most were still operational on D-day. They slaughtered our soldiers. Note the hilt of the sword, a monument to the U.S. Rangers who scaled the clifs near Pointe du Hoc. 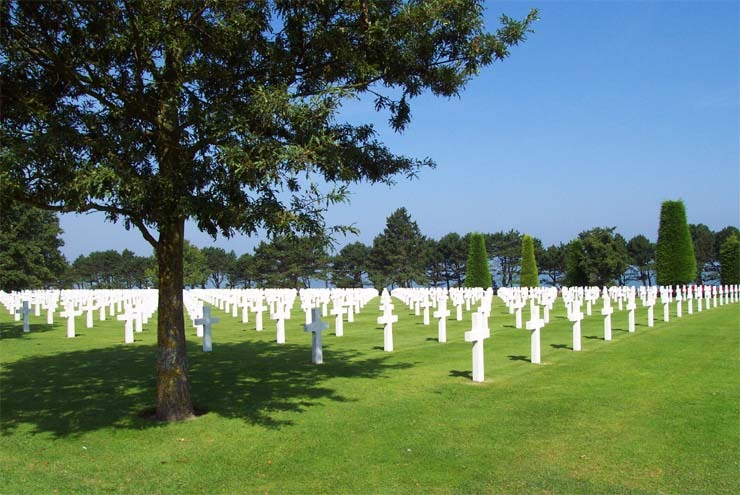 The U.S. Military Cemetery at Colleville is located just above Omaha beach. Note my guide Roel Klinkhamer on the right. This land is American soil a gift of a grateful French nation. The cemetery is perfect in every respect. 9,386 white Carrara marble grave stones in perfect rows create a dignified and powerful effect. The son of President Theodore Roosevelt and a distant cousin of mine is buried in this hallowed spot. 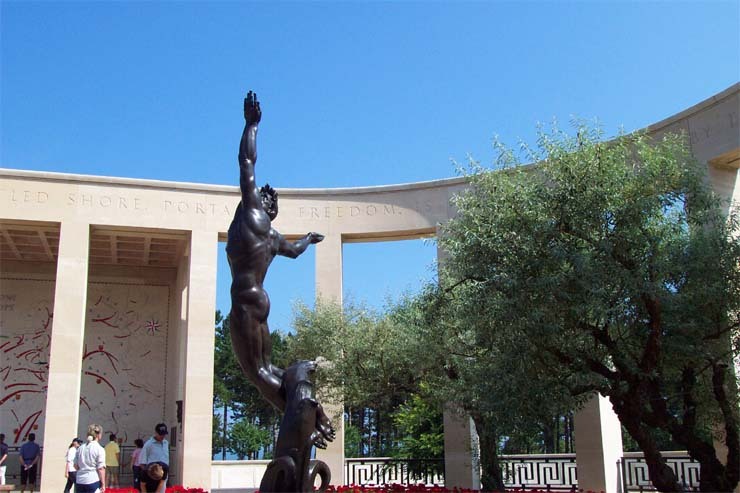 Statue to the Spirit of Youth is a focal point to Memorial which houses maps and the names of the missing. The D-day invasion arrows branch out to victory over Germany in just 11 months. 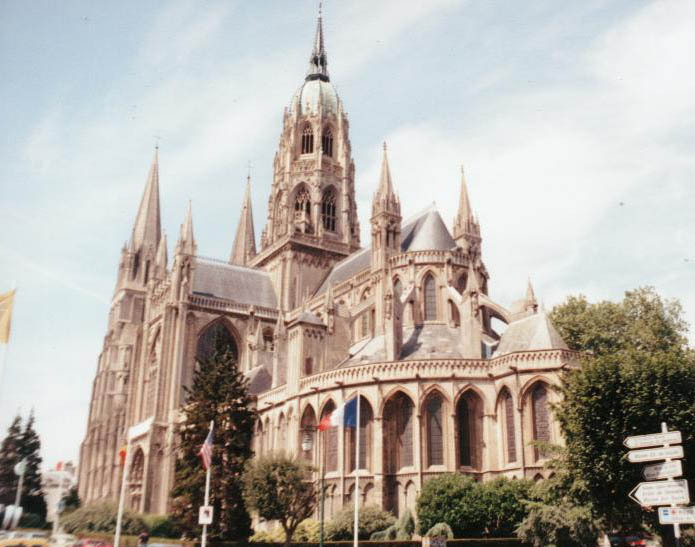 The Bayeux Cathedral was dedicated by William the Conqueror and was not damaged in WWII. The Bayeux Tapestry is over 900 years old. It explains and justifies the Norman conquest of England. 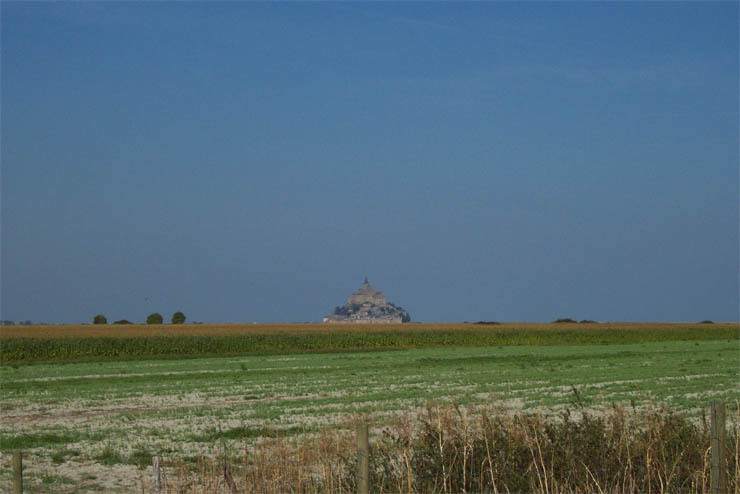 Suddenly you see the famous abby of Mont St. Michel appearing to float above the corn fields. Construction started in 708 and continued for over 1000 years. This is a wonder of the world. 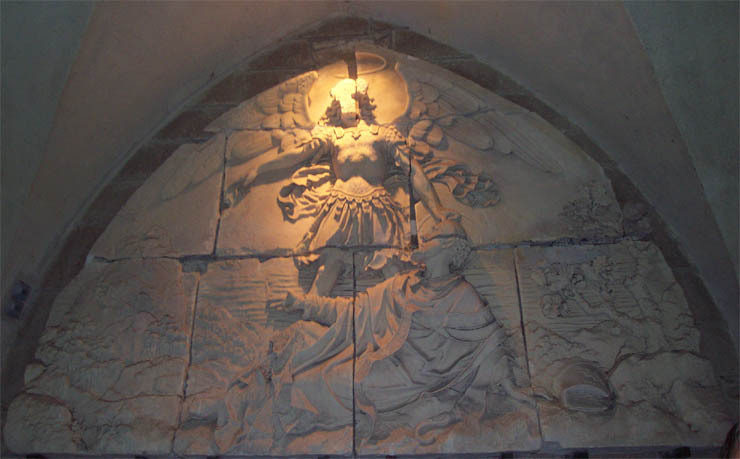 The archangel Michel appeared to the abbot in a dream and insisted that he build this abby. Note thumb on forehead. 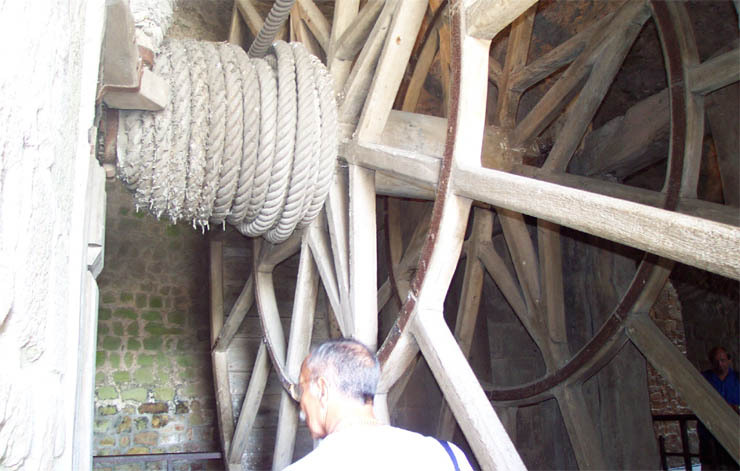 In the 19th century, it became a prison and 4 prisoners were used like hamsters to walk inside the wheel. 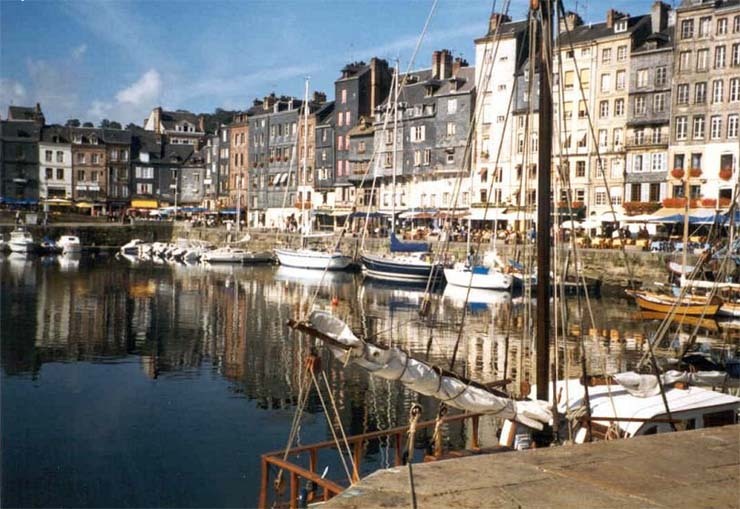 The harbor of Honfleur is small and picturesque. A favorite with tourists who take ships on the Seine to Paris The church is made of wood and is over 500 years old. It has been doubled in size on two occasions. 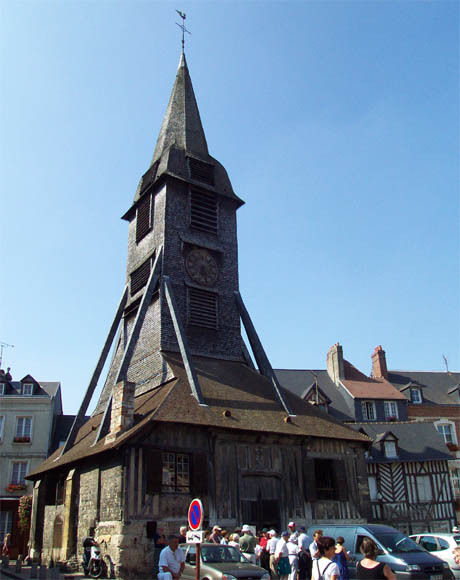 One unique feature was the constuction of a separate building to hold the church steeple and bell because the original church could not support the weight of the bell. 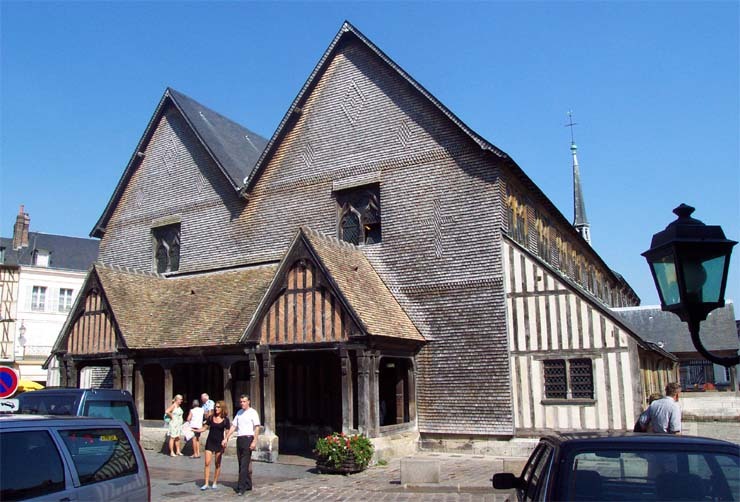 My first immigrant ancestor to North America, Jacques Hertel, who was born in 1603, left from Honfleur with Champlain in 1613 or 1615. He became Champlain's interpreter.